On the day I showed up for the first day at my new job with the city of Denton, I noticed a look of nervous apprehension from a rawboned guy in an adjoining office. He thought he knew me, I guessed, but I couldn’t place him. Nodding politely, I went on into the computer room. He wore his persona well, but it was his droll sense of humor that lured me into his office to chat. Due to that friendship, he put in a good word for me. After completing a test assignment by the City’s Director of Data Processing, I was hired to be their next data control manager. The City had squeezed its fledgling computer center into a space too small and too hot next to the ready room for the gas, electricity and water meter readers. We shared a short hall with the police department. Denton in the 1970s was not the big city. One of the meter readers, the skinny man I saw on my first day, eyed me anxiously for a couple of months. I remained amicable with him as with all my new coworkers. Eventually, he spoke to me. Now I recalled who he was. “No,” I said. The tension in his face that had marked our previous encounters relaxed into a gentle smile. He gave me a firm nod that indicated gratitude and respect. Several years earlier, my buddy Rick and I were recovering from work on a stiflingly hot summer’s afternoon. We had just returned to his place after a grueling day framing a new house. Well, Rick was doing the framing; I was merely filling in as a helper on his crew. There was no cloud cover, no wind, and no reason to do anything but sit very still in the path of a window fan. That and nurse a cold beer, which we were doing to the best of our ability. The meager breeze from the fan was beginning to revive us, but we were still shiny with sweat. Too tired to talk, my friend cranked up Fleetwood Mac on the stereo. There we sat until the sound of a family dispute drifted in over the music. We looked at each other and shrugged. A hot day, a tiny house and kids home from the summer; these things were bound to happen. Then it got louder. And louder. Suddenly a barefoot boy in shorts and a t-shirt burst through Rick’s screen door. Tears were streaming down his face. “Mommy needs help! Daddy’s got a gun an’ says he’s gonna kill his self! Rick and I jumped up and ran out his door with the kid just ahead of us. The boy stopped outside and pointed at the open front door to his home. Rick darted through first with me close behind. The living room was empty. My friend went toward the room on our left while I shot into one to the right. I found the action. Dead ahead of me in front of a dresser, a scrawny man held a rifle to his head. A woman next to the bed fluttered her hands in frantic desperation. Without breaking stride, I took the poor guy down with a flying tackle. Not a second later, Rick was on top of us, controlling the direction of the gun barrel with both hands. My ears ached from the blast of the rifle going off, but the bullet flew harmlessly into the wall. Rick, stronger than the despondent man and I put together, wrested the rifle from his hands and stood up. “What the hell is going on here?” he demanded. “I can’t provide for my family!” cried the man. I still had him pinned to the ground. The man went limp and just lay there crying after I got off of him. He was as miserable as anyone I had ever seen. Rick kneeled on the floor and tried to reassure him. At our feet, Rick was softly repeating, “It’s going to be all right. It’s going to be all right,” as a tear slid down his face. I, too, was misting up. Without revealing this event, Rick collected donations for the distressed family from our poor student friends and me. He also spoke with their mutual landlord about cutting his neighbors a little slack. The landlord, barely getting by himself, agreed to help. A week after I assured the meter reader that his past troubles would stay in the past, he approached me in the computer room. He handed me a blue paper folder with pockets. Inside one sleeve were images cut out of a magazine of some promotional pictures and the poster for a movie called The Thin Man. The other opening held two cassette tapes containing the soundtrack to the film. He recorded them himself, with commercials partly cut out, from an afternoon matinee on television. “You will love this,” he said. He was right. Listening to it that night, I was quickly taken in by the fast, funny patter from William Powell and Myrna Loy as Nick and Nora. A fan of Sherlock Holmes, I was intrigued by the intricate plot and Nick’s end game. A few years later, as video rental stores began popping up, I bought a VHS player. Finally, I could not just hear, but see the movie in its silvery perfection. 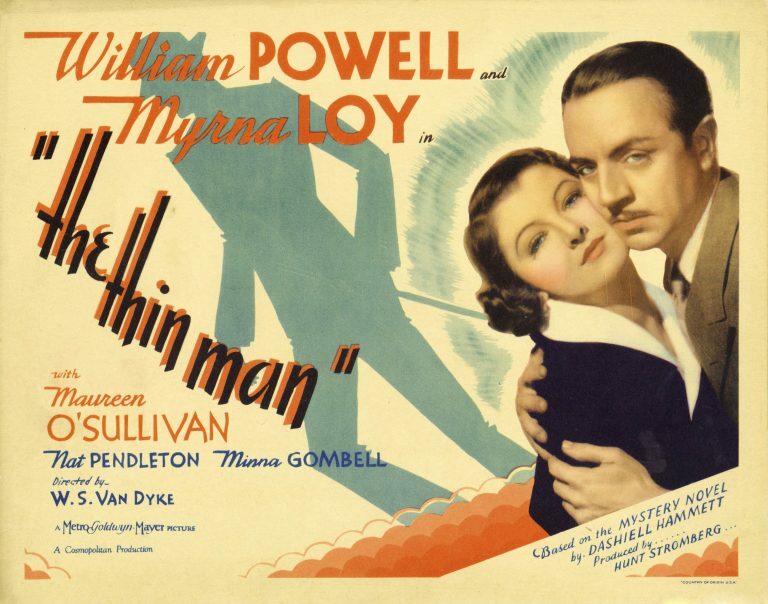 What’s more, not only did I discover the rest of the Thin Man series, I got hooked on vintage cinema in general. These old films became a respite from a troubling world for me. When I found Turner Classic Movies on cable television, I was in heaven. To this day I remain amazed that a moment’s worth of unthinking kindness and a little thoughtful discretion changed my life. Due to a remarkable, considerate gift from a thin man, I experienced a thousandfold return of blessings.